"Gentle Effective Healthcare For All Ages and Lifestyles"
Gregory M. Culbert, D.C., F.A.C.O. "Eagle River's Only Board-Certified Chiropractic Orthopedist"
Regular chiropractic adjustments helps one of our patients do what he loves! What favorite activity can chiropractic help you with? 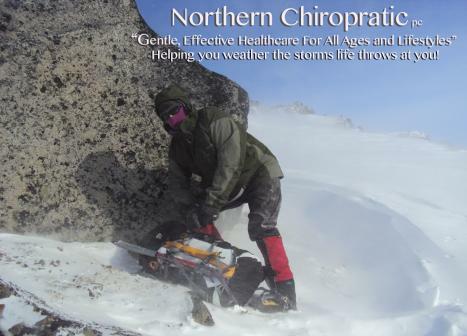 Northern Chiropractic has been a part of the Eagle River community since 1993. Our hours of operation are Monday/Wednesday 7:00 a.m. to 5:00 p.m. and Tuesday/Thursday 8:00 a.m. to 6:00 p.m. We are open 8:00 a.m. to 11:00 a.m. on select Fridays. Chiropractic care is beneficial for more than just back or neck pain. Dr. Culbert is an expert at neuro-musculoskeletal conditions and has post-doctorate training in orthopedics and whiplash associated disorders. He is qualified to diagnose and treat many conditions that may or may not be directly related to the spine. We treat injured and painful shoulders, hips, knees, wrists, etc. We also have good success at treating pinched nerves including sciatica, cervical radiculopathy (pinched nerve in the neck) and carpal tunnel syndrome. Tendinitis and impingement syndromes are also commonly seen here. Deep tissue massage including myofascial release is available at Northern Chiropractic. Our doctor and therapists are well versed in rehabilitative techniques, and part of our treatment always includes rehabilitative stretch and exercise. Like it or not, you are probably going to live longer than you ever thought. We at Northern Chiropractic want to help you maintain your structural health allowing you to maintain a happy and healthy lifestyle. Who wants to spend the last 10-15 years of their life in a nursing home? *Want more information about the 100-Year Lifestyle? See our 100-Year Lifestyle website at www.northernchiropractic.net. Northern Chiropractic is the leading chiropractic office in Eagle River providing the highest quality, drug-free healthcare in the area. We maintain high integrity and honesty in our desire to enable our patients to live life to the fullest in their daily activities as well as their recreational pursuits. Thank you for taking the time to visit our website, and we look forward to serving you!